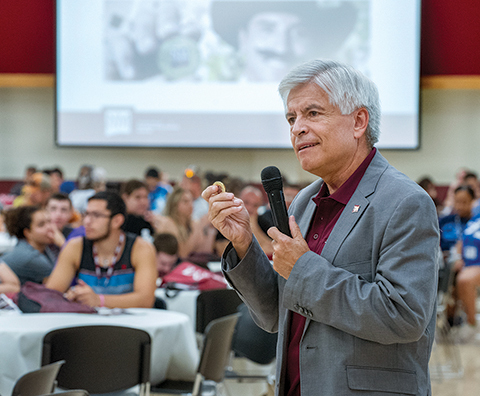 NMSU Chancellor Dan Arvizu speaks to students and their families at an Aggie Welcome Orientation session in summer 2018. 07/24/2018: New Mexico State University Chancellor Dan Arvizu speaks with middle school students during a STEM event sponsored by Verizon at the NMSU campus. (NMSU photo by Andres Leighton)Spend just a few minutes with Dan Arvizu and you’ll see he isn’t a guy who likes to stand around. He’s full of energy – and in a hurry to get some big things done. For Arvizu, those traits will definitely come in handy. As New Mexico State University’s new chancellor, he is working to position the university to address some of the grand challenges of our time. Arvizu graduated from NMSU’s College of Engineering in 1973 and went on to have a long, distinguished career in advanced energy research and development, materials and process sciences and technology commercialization. He worked for Bell Labs, Sandia National Labs and eventually went on to serve as the eighth director of the U.S. Department of Energy’s National Renewable Energy Laboratory in Golden, Colorado. Most recently, he served in various roles at Emerson Collective, including chief technology officer, STEM evangelist and senior adviser. On the job with NMSU since June 2018, Arvizu has begun to outline top-level priorities for the university and learn how those priorities relate to a number of grand challenges NMSU will begin to address. Those priorities are to improve student success, elevate research and creativity and to amplify outreach and economic development. With these priorities in mind, NMSU will address the challenges of fortifying K-16 education, creating healthy borders and modernizing critical infrastructure. 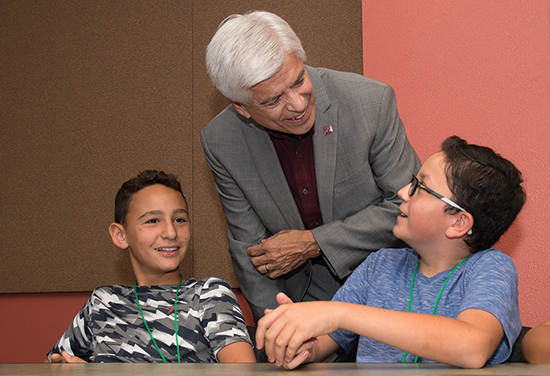 NMSU Chancellor Dan Arvizu chats with Luis Garcia (right) and Jacob Martinez (left), participants in the NMSU Verizon Innovation Learning program, a three-week, summer camp in July 2018 that focused on STEM activities for minority middle school boys. Arvizu says NMSU benefits from its geographic location near the U.S./Mexico border, and he feels there are opportunities to shape the discussion on how international trade should occur. “When it comes to the border, it won’t be just changing the tone of the conversation, it will be us demonstrating and showing the way,” he says. In the area of modernizing critical infrastructure, Arvizu wants to focus on water, food, energy, information technology and agriculture. He says NMSU has an opportunity to build on existing partnerships and make NMSU students more relevant in the workplace over the coming decades. Those partnerships can also aid in economic development.